We could not be happier with our experience at Castaway Cottage. 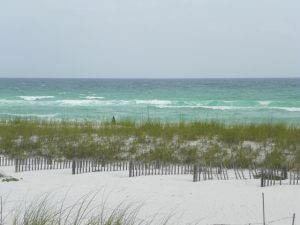 We loved every minute of our vacation & so much of that had to do with the location & amenities of Castaway Cottage. 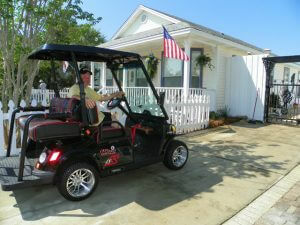 We absolutely loved using the golf cart & being able to ride to several area restaurants. Same thing with the bicycles on property. So nice to be able to jump on one & have a nice ride along the beach & stop for lunch. The Owners have gone above and beyond in attention to detail. The property was very clean & that is of upmost importance to me. The fact that the property is pet-friendly should NOT discourage those traveling without pets. You would never know pets have stayed at the property from a cleanliness stand point. Being a former travel agent for 9 years, I’ve stayed in many luxury hotels & resorts. So I’m extremely picky in choosing a privately owned home. 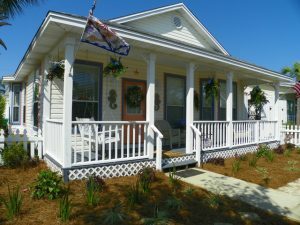 I would return to Castaway Cottage again & again & would not hesitate (and already have) recommended to family & friends! Recommended for: Tourists without a car, girls getaway, pet owners, romantic getaway, age 55+, families with young children, families with teenagers. Our stay at the Castaway Cottage was incredible! There was nothing that could have been changed or improved. The beds were super comfortable and the bedding was amazing quality. In fact the quality of furnishings of the entire home were suberb. The owners have thought of everything one could possibly need while staying away from home!! Thanks for a great vacation! Recommended for: Adventure seekers, tourists without a car, girls getaway, pet owners, romantic getaway, sightseeing, age 55+, families with young children, families with teenagers. 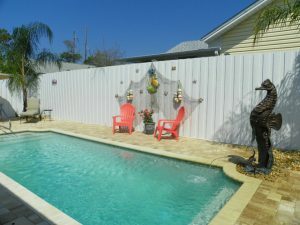 Castaway Cottage is a beautiful home, well appointed, very comfortable and in an ideal location. Our stay couldn’t have been any better. We enjoyed the layout of the cottage on the inside as well as the outside including the pool. It is close to restaurants and grocery stores. The kitchen is perfect for cooking on those nights you just don’t want to go out. We highly recommend this home for couples of all ages. We will definitely rent this cottage again. Recommended for: Pet owners, romantic getaway, age 55+. Everything you see and more-can’t wait to come back! This was a most enjoyable week just a home away from home. The house was all newly furnished and decorated. It looks exactly like the pictures. This was a real find. The kitchen has everything you need if you want to cook. It’s so close to the beach you can walk if you want to.. A beautiful well kept neighborhood, quite and peaceful and just 2 blocks away from anything you could need, restaurants shopping centers, drug stores. We look forward to coming here again. Recommended for: Adventure seekers, tourists without a car, girls getaway, pet owners, romantic getaway, sightseeing, people with disabilities, age 55+, families with young children, families with teenagers.